Download "Sites of Battle: Photographs of War-Torn Landscapes. 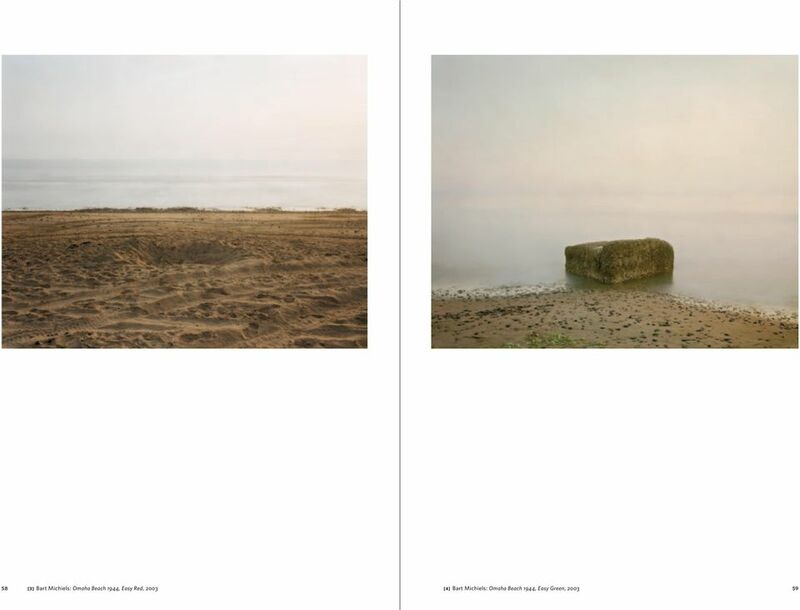 On Bart Michiels The Course of History Photographs Sonja Fessel"
1 Sites of Battle: Photographs of War-Torn Landscapes. 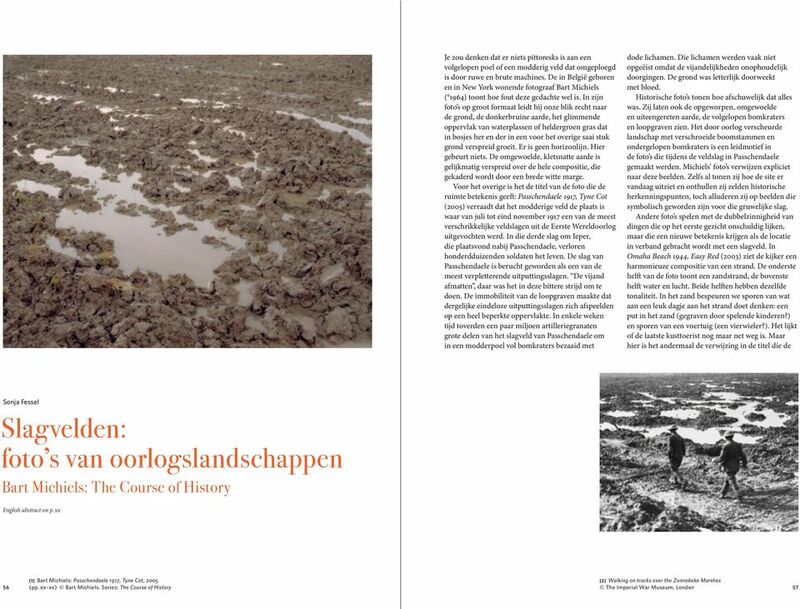 On Bart Michiels The Course of History Photographs Sonja Fessel One would think that there is nothing picturesque about a water-logged puddle, a muddy field churned up by brute machinery. The Belgian-born New York-based photographer Bart Michiels (1964-) proves us to be mistaken. In his large format photograph he directs our gaze straight onto the ground, onto the dark brown soil, the shiny surface of the accumulated water, scattered tufts of bright green grass amid an otherwise dreary patch of earth. There is no horizon line. Nothing happens here. The stirred up, soaked earth spreads out evenly in an all-over composition, which is framed by a broad white margin. It is the title of the photograph that fills the space with further meaning. Passchendaele 1917, Tyne Cot (2005) reveals the muddy field to be the site of one of the fiercest battles of the First World War, fought from July through November In the third battle of Ypres near Passchendaele, hundreds of thousands of soldiers lost their lives in devastating combat. 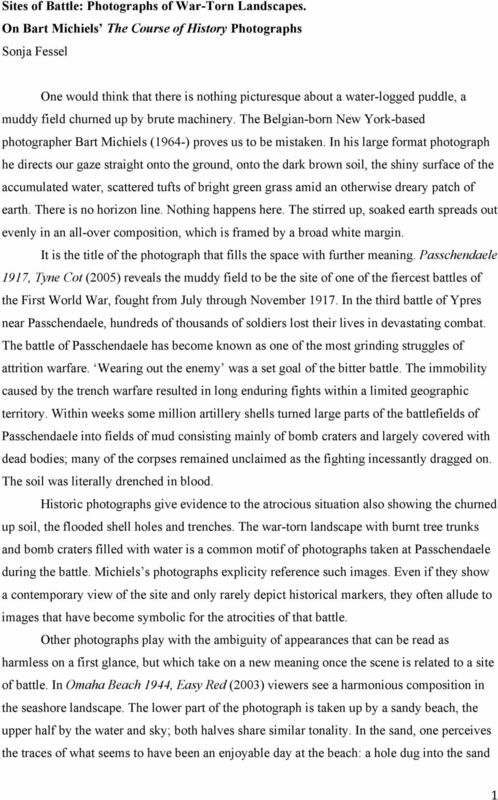 The battle of Passchendaele has become known as one of the most grinding struggles of attrition warfare. Wearing out the enemy was a set goal of the bitter battle. The immobility caused by the trench warfare resulted in long enduring fights within a limited geographic territory. Within weeks some million artillery shells turned large parts of the battlefields of Passchendaele into fields of mud consisting mainly of bomb craters and largely covered with dead bodies; many of the corpses remained unclaimed as the fighting incessantly dragged on. The soil was literally drenched in blood. Historic photographs give evidence to the atrocious situation also showing the churned up soil, the flooded shell holes and trenches. The war-torn landscape with burnt tree trunks and bomb craters filled with water is a common motif of photographs taken at Passchendaele during the battle. Michiels s photographs explicity reference such images. Even if they show a contemporary view of the site and only rarely depict historical markers, they often allude to images that have become symbolic for the atrocities of that battle. Other photographs play with the ambiguity of appearances that can be read as harmless on a first glance, but which take on a new meaning once the scene is related to a site of battle. In Omaha Beach 1944, Easy Red (2003) viewers see a harmonious composition in the seashore landscape. The lower part of the photograph is taken up by a sandy beach, the upper half by the water and sky; both halves share similar tonality. In the sand, one perceives the traces of what seems to have been an enjoyable day at the beach: a hole dug into the sand! "! 2 (maybe by playing children?) and tracks of a vehicle (possibly by a quad?). The beach seems to have been just recently abandoned. But again, it is the reference in the title that gives the scenery a more apocalyptic meaning. It reveals the beach as the location of one of the decisive historic events of the Second World War well known as D-Day. Easy Red is the name of one of the landing shores, where on June 6, 1944 the Allies attacked the German occupying forces in the Normandy. In the past years, both the battle of Passchendaele and the Normandy landings have received much attention by historians as well as by the mass media. In general, the battles of the First and Second World War have been the topic of many publications, TV documentaries, but also of Hollywood films. The famous Steven Spielberg production Saving Private Ryan (1998) and the Canadian film Passchendaele (2008), produced by Paul Gross, are only two examples of contemporary media engagement with the violent and traumatic events of the past. Such films, as well as iconic photographs, such as those of the Normandy landings by Magnum photographer Robert Capa, shape the collective memory of many including that of the post-war generations. One of the most well-known war photographs to which Michiels alludes is Roger Fenton s The Valley of the Shadow of Death (1855). Taken during the Crimean War it shows a wide, desolate landscape with a winding road and cannonballs scattered across the scenery. Partially due to the complex equipment and lengthy exposure times, Fenton s photographs do not show the actual fighting. They also do not show the casualties of the battle. The scene of battle has been left, leaving behind merely the tremendous amount of cannonballs. With his photographs of the Crimean War Fenton did not only become the first British war photographer, but he also introduced an alternative representation of war. Instead of showing the dreadful atrocities he portrayed the landscape of aftermath. 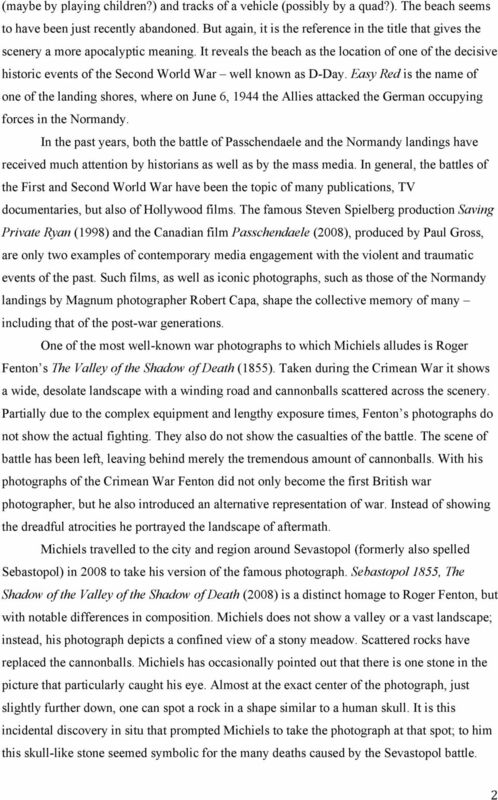 Michiels travelled to the city and region around Sevastopol (formerly also spelled Sebastopol) in 2008 to take his version of the famous photograph. Sebastopol 1855, The Shadow of the Valley of the Shadow of Death (2008) is a distinct homage to Roger Fenton, but with notable differences in composition. 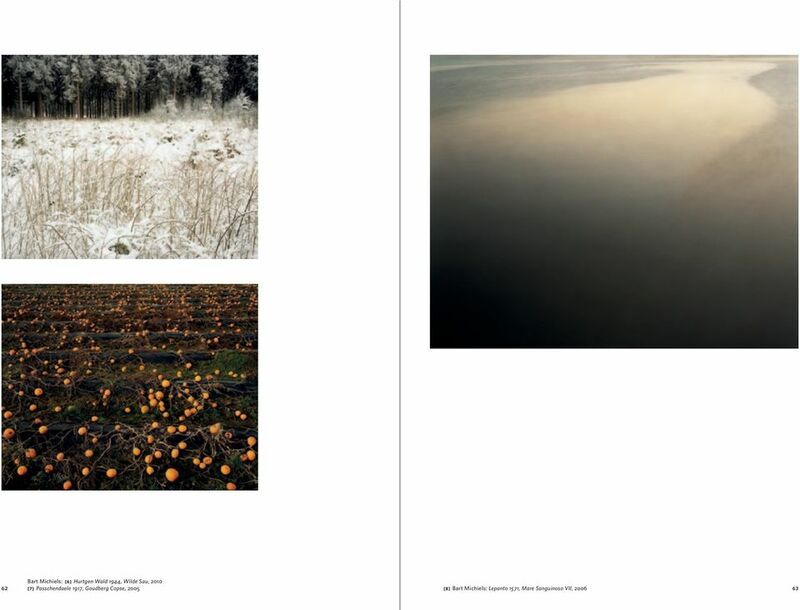 Michiels does not show a valley or a vast landscape; instead, his photograph depicts a confined view of a stony meadow. Scattered rocks have replaced the cannonballs. Michiels has occasionally pointed out that there is one stone in the picture that particularly caught his eye. Almost at the exact center of the photograph, just slightly further down, one can spot a rock in a shape similar to a human skull. It is this incidental discovery in situ that prompted Michiels to take the photograph at that spot; to him this skull-like stone seemed symbolic for the many deaths caused by the Sevastopol battle.! #! 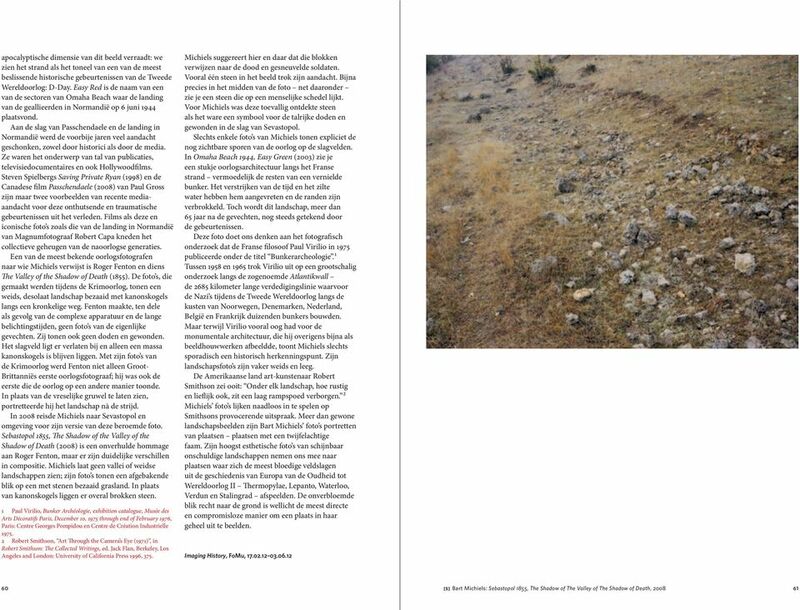 3 Only few of Michiels photographs explicitly show the traces of the war still visible at the battle sites. Omaha Beach 1944, Easy Green (2003) depicts a fragment of wartime architecture along the French seashore likely the remains of a destroyed bunker. The passing of time as well as the salty water have caused corrosion and grinded the edges. Nevertheless, more than 65 years after the fighting, the landscape is still marked by the historic events. This photograph brings to mind the French philosopher Paul Virilio s photographic investigation published as Bunker Archaeology (1975). 1 Between 1958 and 1965 Virilio undertook a phenomenological inquiry along the so-called Atlantic Wall, where along the coastlines of Norway, Denmark, the Netherlands, Belgium and France during the Second World War several thousand bunkers were built by the Nazi regime. But while Virilio focused on the monumental architecture, often depicted in a sculpture-like manner, Michiels only scarcely includes historical markers at all. More often his landscape photographs are wide and empty. The American earth artist Robert Smithson once stated: each landscape, no matter how calm and lovely, conceals a substrata of disaster. 2 Michiels s photographs seem to directly engage with Smithson s provocative statement. More than merely representing landscapes, Bart Michiels s photographs portray places places of dubious fame. His highly aesthetic photographs of seemingly innocent landscapes take us to the sites of the most violent battles in European History from Antiquity to World War II: Thermopylae, Lepanto, Waterloo and Stalingrad. The straight view onto the ground is likely the most direct and uncompromising way of picturing place all together.!!!!!!!!!!!!!!!!!!!!!!!!!!!!!!!!!!!!!!!!!!!!!!!!!!!!!!!! "!Paul Virilio, Bunker Archéologie, exhibition catalogue, Musée des Arts Décoratifs Paris, December 10, 1975 through end of February 1976, Paris: Centre Georges Pompidou and Centre de Création Industrielle 1975.! 1975 through end of February 1976, Paris: Centre Georges Pompidou and Centre de Création Industrielle 1975.! 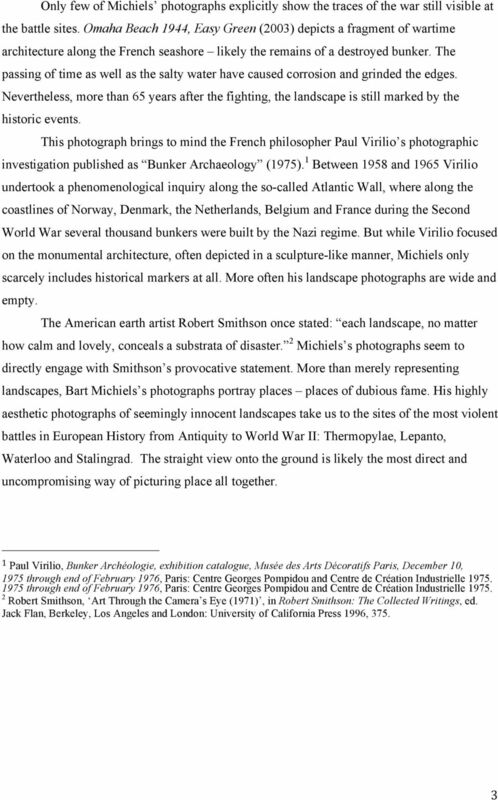 2 Robert Smithson, Art Through the Camera s Eye (1971), in Robert Smithson: The Collected Writings, ed. Jack Flan, Berkeley, Los Angeles and London: University of California Press 1996, 375.!! $! Main language Dit is de basiswoordenschat. Deze woorden moeten de leerlingen zowel passief als actief kennen. Teksten van de liederen die gospelkoor Inspiration tijdens deze Openluchtdienst zingt. 1. In welk deel van de wereld ligt Nederland? 2. Wat betekent Nederland? Zalu.be BOOK REVIEW: Chinese Tattoo Art (Edition Reuss) 1 / 7 Zalu.be Tekst in Engels, Frans, Chinees en Duits. Dit is het meest omvangrijke verzamelwerk over de kunst van het tatoeëren in China en Taiwan. Uiteraard zouden we ook aangeven dat het copyright op de afbeelding bij u ligt, en dat de afbeelding gebruikt is met uw toestemming. 04/11/2013. Sluitersnelheid: 1/50 sec = 0.02 sec. Frameduur= 2 x sluitersnelheid= 2/50 = 1/25 = 0.04 sec. Framerate= 1/0. Voorbeelden van machtigingsformulieren Nederlands Engels. Examples of authorisation forms (mandates) Dutch English. Juli 2012 Versie 2. Settings for the C100BRS4 MAC Address Spoofing with cable Internet. Firewall van de Speedtouch 789wl volledig uitschakelen? Map showing countries shaded by their position in the Happy Planet Index (2006). The highestranked countries are bright green, the lowest are brown. Happy Planet Index There is a growing global consensus that we need new measures of progress. It is critical that these measures clearly reflect what we value something the current approach fails to do. Festival. Questions. Worksheet. Flash info. Bekijk de poster. Het is een aankondiging voor een muziekfestival. Welke bands die komen vind jij leuk? Understanding and being understood begins with speaking Dutch Begrijpen en begrepen worden begint met het spreken van de Nederlandse taal The Dutch language links us all Wat leest u in deze folder? 1. Opgave 2 Geef een korte uitleg van elk van de volgende concepten: De Yield-to-Maturity of a coupon bond. TE HUUR. Kazernestraat 31 D 2514 CR 's-gravenhage p.m. ex. 16 films die jou inspireren om je eigen legende te creëren! Houdt u er alstublieft rekening mee dat het 5 werkdagen kan duren voordat uw taalniveau beoordeeld is. Relationele Databases 2002/2003 Hoorcollege 4 8 mei 2003 Jaap Kamps & Maarten de Rijke April Juli 2003 1 Plan voor Vandaag Praktische dingen Huiswerk 3.1, 3.2, 3.3, 3.4, 3.5. SQL Aantekeningen 2 Tabellen. Op het potje Potty training Wat is zindelijkheid? Je kind is zindelijk als het: - niet meer in zijn broek plast. - overdag droog is. - zelf op het potje of het toilet gaat zitten wanneer het moet plassen. Hiphop Deze tekst gaat over hiphop. Wat is hiphop? Interactive Grammar leert de belangrijkste regels van de Engelste spelling en grammatica aan. Fans about Martin Wat vind jij van Martin Garrix? 1 read Fans talking about Martin Martin Garrix is a world famous DJ from Holland. Yesterday we interviewed two of Martin s fans. This is what they said. Shopping. Questions. Worksheet. 1 read Bekijk goed wat er te koop is in de webwinkel van Ed Sheeran. Wat zou jij wel willen hebben?